Democrats beat Republicans 11 to 2 in the 108th annual Congressional Baseball game last night before a record-breaking crowd of 25,000 Members of Congress, White House officials, hill staffers, fans and members of the media. The victory was secondary, however, to the unified spirit of the occasion, dedicated to those that weren't there - the victims of Wednesday's tragic shooting in Alexandria, Virginia, where a lone gunman opened fire on Republican Members of Congress who were practicing for the game. The shooter, who was killed in the crossfire by Capitol Hill police who were on hand for security, critically wounded House Republican Whip Steve Scalise (R-LA), and injured two officers, a lobbyist and hill staffer. 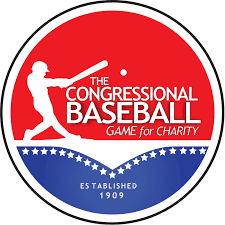 Founded in 1909, the Congressional Baseball Game is an annual event that Members of Congress and fans look forward to - as the one occassion when House and Senate members of each party put aside partisan politics and play baseball in a friendly competition to raise money for charity. Members, sporting the uniforms of their home states, raised an unprecedented $1.5 million for The Washington Literacy Center, The Boys and Girls Club of Greater DC, and the Washington Nationals Dream Foundation. There was never a question about canceling the game and succumbing to the fear instilled by this gunman or any other larger threat. Both teams were determined to play in the spirit of support for the victims, and in defiance of the shooting; and thousands flocked to National's stadium in agreement. The memorable moments of the game were not in the plays, but in the mood of the night, and the acts of comradery on the field. 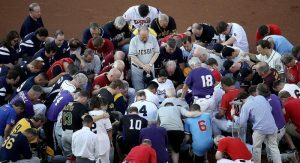 The game began with a bipartisan prayer on the field, followed by the opening ceremonial pitch by Capitol Police officer David Bailey, who was one of those injured in the shooting. Bailey, who was on crutches, threw a ball given to him from former New York Yankees manager Joe Torre. At the close of their winning ball game Congressman Mike Doyle (D-PA), the Democrats' manager, gave the trophy to Congressman Joe Barton (R-Tx), who was leading the Republicans, to put in Congressman Scalise's office while he recovers from his injuries. The evening also brought the good news that Scalise had successfully made it through three surgeries, although still in critical, but improved condition. Many are hoping the spirit of bipartisan unity will transfer to the Capitol as Members of Congress return next week. For now, enjoy the reprieve and the weekend! DemDaily: Bullies at the Ballot Box!